2014 has opened with a bang and the Sunday Lunch series is back on with a vengeance. 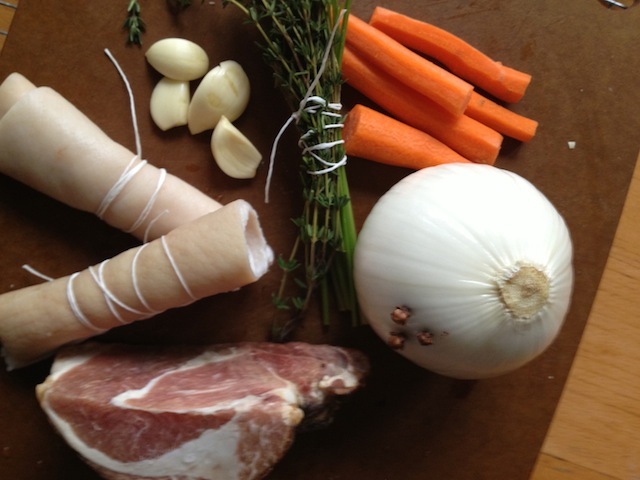 The latest one was a perennial favorite – Cassoulet Sunday! Nothing gives a bigger middle finger to polar vortexes, dibs on shoveled parking spaces and wearing thermal underwear to the office than a steaming clay pot of beans, tasty duck parts and equally tasty pig parts. It’s a helluva dish and if you’re not making it, then I feel sorry for you. As is common with classic and deeply loved regional dishes, there are all kinds of legends and lore, rules and parameters but, at it’s core, its really just an incredibly delicious pot of baked pork and beans. Follow my friend Kate’s recipe and you won’t go wrong. In fact, I think you should make this version at least once so you know. I mean really know with a deep understanding of what this seemingly simple dish can be. Even better if you can go to Southwest France, in the winter of course, and experience it in it’s original habitat. Then you’ll really know. But you can certainly make it at home – I do, every year. 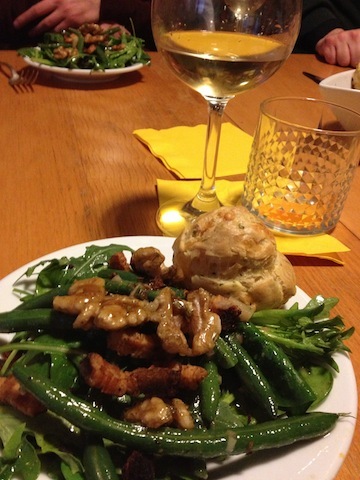 Depending on where you live, it can be a challenge if you choose to accept it – special beans, duck confit, particular sausages, a roll of pig skin and a special clay pot called a cassole. But that shouldn’t deter you. A perfectly delicious cassoulet can be made with ingredients easily found in your local grocery store – white beans, salt pork, mild sausages and a nice heavy pot. I think it’s more important to make it then to skip it because it won’t be perfect. The point is to get there; the journey is your own. Then a nice salad with mixed greens, candied walnuts and green beans tossed in a sharp sherry vinaigrette. And bacon. I don’t care if bacon is “over”; it will always be delicous. The salad was lovely, something on the light side with a bit of acidity to prepare for the richness to come. The wine, numerous bottles by this point, was awfully delicious too. 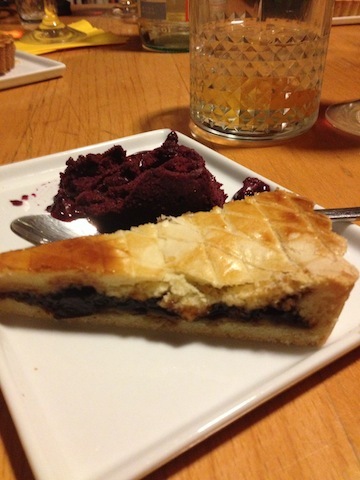 Dessert was Gateau Basque, the classic Southwestern French dessert, a sort of cake-like tart filled with dark cherry jam. While in the Basque town of Espelette a few summers ago, I tasted my ideal and have been trying to recreate it ever since. I held out great hopes for this one, translated from a favorite Basque bakery cookbook, but it was not to be. Delicious certainly, but not quite the one. On the bright side, I learned several new French words and phrases with the help of Google translate and the Concord Grape Sorbet I served alongside was rather remarkable. Can I just recommend one thing? Do the post dinner drinks. Get out those cognacs and bourbons and scotches and even the Bailey’s if that’s your thing. All that fancy stuff you’re saving for god knows what. Use it! Share it! It’s good for the digestion. Pour a round of pretty little glasses and set out a little plate of cookies or chocolates or whatever small sweet nibble you have. Then sit around, have a few sips of something burning and laugh. Just outright laugh. It is the very best way to end an enjoyable meal with friends, like a really good encore, and sends the evening off on a high note. Everyone goes home with that warm feeling in their belly that only something boozy can bring and a smile on their faces. It’s wonderful. And the next day, as your sorting through the detritus of the previous evening, chances are good you’ll still be smiling. STRESS BAKING THERAPY FACTOR: C’EST BON! C’EST TRES BON!! Really now, it doesn’t get much better. This one is special for me as it sort of brings my Gascon friends together with my Chicago friends for one big hilarious party. I’m that person that goes to great lengths on this one; I usually have a few tinned items socked away from my last trip to France, bake in the requisite French cassole, I mail order the damn special beans and hit up a great local butcher shop for the particular sausages. It’s how I like it and my friends appreciate it. At least I think they do. They sure eat like they do. On this blog five years ago: Khachapuri – and just in time for the Sochi Olympics! we appreciate it! delicious, as always kath. thanks for all you do! Brava Kathy for rounding up the usual suspects… I’m cassouleting this weekend as well- as the rain against the new roof on the barn is driving me to cook, cook, cook in anticipation of the my new app “Cassoulet- a French Obsession”. coming to an iTunes store near you soon! Love the bacon salad! 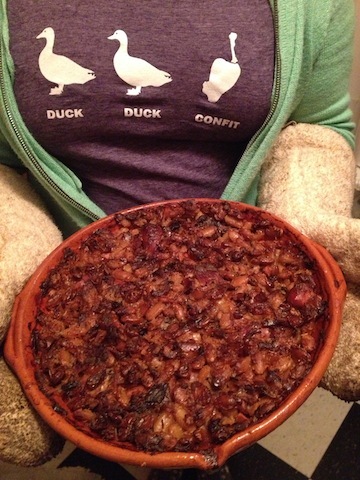 What meats/sausages do you put in your cassoulet? And where do you recommend purchasing said meat in Chi-town? Karen! 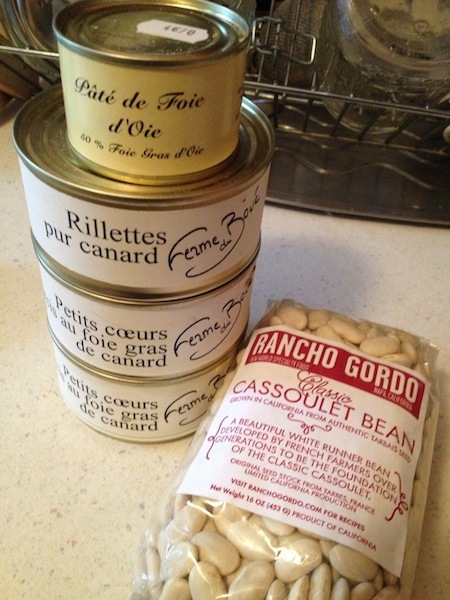 I order the beans from Rancho Gordo but I’m sure Whole Foods has flageolet in bulk. Duck Confit and pork belly rom Paulina. Saucisson de Toulouse from Butcher & Larder (he has it nearly always but call.) If you call ahead, I bet Rob at B&L could also save you a piece of pork skin. Or I have one in my freezer if you’d like it! Pork tenderloin and bacon were in my freezer. This looks like a wonderful, well thought out meal. Wish I could eat the screen. Rancho Gordo beans are the best! Just discovered them recently… amazing! 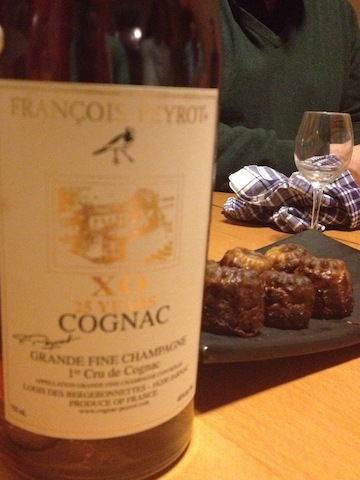 And are those canelles I see behind the bottle of Cognac? Perfection!